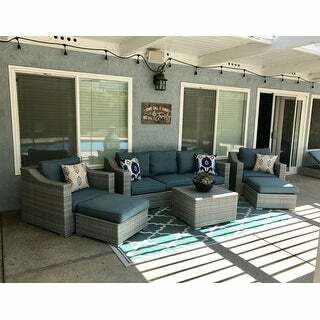 I love this set goes perfectly on my patio, it is large but very nice looking, cushions need to be washed every once in awhile. Overall these colors go with just about anything. I would recommend this set to everyone. Dress up your patio, yard and pool side with this attractive 9-piece grey wicker outdoor sectional furniture set by Corvus. 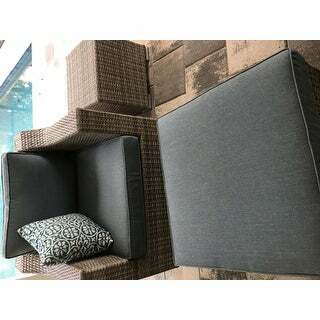 Made of powder coated aluminum frame and hand woven wicker, the sofa set features durability and long lasting performance for perfect outdoor use. The cushions add extra comfort to the set, along with four uniquely patterned pillows for a light hue and splendor. Flexible and configured, it offers perfect and spacious seating areas in your patio. So this is absolutely beautiful, lightweight and easy to move...only detractor is cushions are not that comfortable but will do. Wasn't really any assembly, just unwrap cushions and put clips on sofa pieces so they don't separate and those just snap on. Arms are at a comfortable height and the resin wicker seems nice. The cushions were not attached with Velcro which I thought I had read in another review, but I will just go get some Velcro to hold them on as they tend to want to slide. Customer Service with CEVA home delivery was awful though...but I believe the problem is isolated to the Kansas City facility not the whole system. Overstock should look into it. 2 Delivery schedules missed...finally got my shipment today after calling and calling the KC location. I would recommend this set though and it goes perfectly with Couristan Monaco Tropical Palms/Ocean Indoor/Outdoor Area Rug which I also purchased....set looks amazing! Just received our 9-piece Grey Wicker Sectional Furniture Set and are extremely pleased with the furniture! It is beautiful! Like the other review, when I bought the furniture on Overstock there was a notice that the item included white glove service which lead me to believe the delivery people would be helping open it and taking it to our patio area. This was not the case! Instead, the delivery people told us they could not step foot in our house and had to leave all items at the front door. Three large boxes were left, but luckily my husband was here to help carry items through house to back porch. And, luckily I had read prior review about this issue and was prepared for this to happen! This item arrived 2 days ago. It arrived in 3 boxes which were extremely sturdy for protection. The furniture is absolutely gorgeous. It is sturdy, the cushions are more than ample in thickness and the color is outstanding. I didn't realize that it came with 4 color coordinated cushions which are strong as well full. I have had my spine reconstructed a year ago and very few furniture is comfortable for me for more than a half hour. Last night my cousin came outside to awaken me as I fell asleep for over 3 hours. This is a great set, each chair and sofa are of more than ample seating and very sturdy. There no assembly required either. Don't miss out on this one I understand that as of yesterday there were 15 left. Well, my neighbor just bought on this morning. From ordering to delivery and placing I my cabana every went as smooth as silk. Just as a point of interest, I am not affiliated with Overstock.com just a happy customer with all purchases made. I just had this set delivered today and it looks better than the pictures! It came fully assembled. It's light weight yet sturdy. The cushions repel water which is awesome. My only negative is that the cushions for the ottomans don't stay in place very well. Will need to use velcro or something so they don't slip off when moving your legs/feet. It matches my new trex deck flooring perfectly. The blue is a great color. The arm chairs are fantastic. Very happy! Great choice for my new porch! I was nervous about making a "big" purchase without seeing this or sitting it...the look was right, and so was the price. Delivery was easier than expected...then I realized 1 piece was damaged. I was dreading the return process for a damaged piece...and Overstock could not have made it easier. After a quick clarification of which piece came damaged, the replacement piece was shipped and delivered without issue...SO easy! The cushion color is more muted than it appears in the pictures, the whole set is gorgeous and comfortable. I love that the backs of the seats aren't that high - it doesn't block any of the view from the porch I have this set up on. Thrilled with my purchase! This set is beautiful. Cushions are Grey/blue, not as baby blue as picture. Came very well packed in 3 large boxes. Great quality, great price. After getting this set I decided to buy the dining table set that goes with it! I loved our new outdoor Corvus outdoor patio set. I love the grey color and the teal cushions and I was surprised at the quality for the price. However, I would not purchase this set again. It looks great for the first six weeks, but the cushions do NOT hold up. They are very cheap and thin and they will need to be replaced before summer. Put a better quality cushion on this set and you would have a much better product. Love this set! The blue is not to bright but nice and coastal for sure. The only negative to me, is that the cushions on the seat and chairs slide forward easily and may need a rubber rug gripper for underneath like the ottomans have. They also hold a lot of water if it rains and they’re not covered and take days to dry out so get a cover for sure. 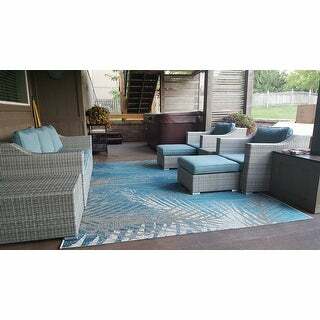 This patio set are perfect colors just as pictured. The wicker is a little lighter weight than expected and hopefully it will be durable. It makes the patio bright and modern. Nice set - great price. Cushions are more like a faded denim color but I like them. Wicker ifurniture is really pretty and appears sturdy. Just bought it so can’t comment on durability. This set was great. Super easy to put together bring it came preassembled. The colors are fantastic. We have used this set almost every night since we got it and we love the compliments we receive as well. Don't hesitate to buy this set it's great. Love our new set- its sturdy & comfortable- cushions not as thick as they appeared in the photo, but easy to clean We were disappointed with the delivery though, on the website when I purchased it said they would unwrap and set it up (white glove service) but the delivery company showed us the paperwork that Overstock did not request them to do so , So i felt that was false advertising- Luckily the 2 Wonderful delivery company men helped us anyway - also would like to note that there were some miscommunications between Overstock and the delivery company before the delivery. I was really disappointed with this set- it isn’t weather prof, so every time it rains we have to store the cushions (otherwise they get soaked through). The color has faded on all of the decorative pillows. For the price I paid for the set, I am really disappointed. This should not be listed as outdoor furniture. Fantastic looking and has a high weight limit which is needed for a lot of people. Just got our set today, and it is a nice looking setup. Every piece in the package was well packaged and labeled. The deliverer would only drop it at our driveway, but the pieces are light so it was easy to carry to our patio. Our patio is covered so expect this to last a while. This set is super comfortable, really nice quality and beautiful. We are very happy with purchase. Slide to easy. Pillows to big. I just got this in. First of all if you are thinking about getting this order it now. It took about a month to get it delivered to my home. It sits very low to the ground. Not good for big or heavy people. We use it after we get out of the pool. So far it’s ok, I thought I was getting something better. They should have people in the picture so you can see what it really looks like. It’s our first piece, kinda expensive so use a coupon if you can find one. "What are the sizes of the cushions?" The seat cushions are 27.5 inches x 23.6 inches, the back cushions are 18.5 inches x 24 inches, and the ottoman cushion is 25.2 inches x 24.4 inches. "Are the cushions made with sumbrella fabric?" The cushions are covered with olefin fabric. "Why does it say sectional when it isn't?" "I need covers for this set to protect it from the winter elements moisture mold sun, Etc." Unfortunately we do not currently offer a cover for this set. "What covers will fit this set to keep them from moisture and mold?" Unfortunately, we do currently have a cover for this set. "what is the seat height without cushions?" The seat height without cushions is approximately 10.8 inches. "How THICK are the seat cushions? How thick are the back cushions? " The seat cushions are approximately 4.9 inches thick, and the back cushions are 7.8 inches thick.